With Skye being Quake and an inhuman, does that leaves open doors to explain super powers to any other Marvel character? 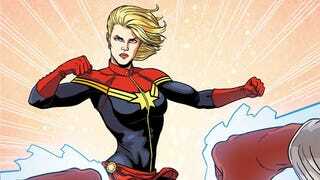 And if is that the case would be much of a leap For Captain Marvel being made into an inhuman? After all it would still make her power connected to the Kree anyway. And how much would the fans complain if that is the plan? Of course that the Kree were already presented to the public with Guardians of the Galaxy, and as origin stories go they can always have Mar-vell running from the Kree and trying to hide on Earth only to be severely injured in an incident involving Carol Danvers and she getting his powers in the process, it wouldn't even need to take 10 minutes of the movie, I suppose. So, what is the most easy route for Captain Marvel movie?